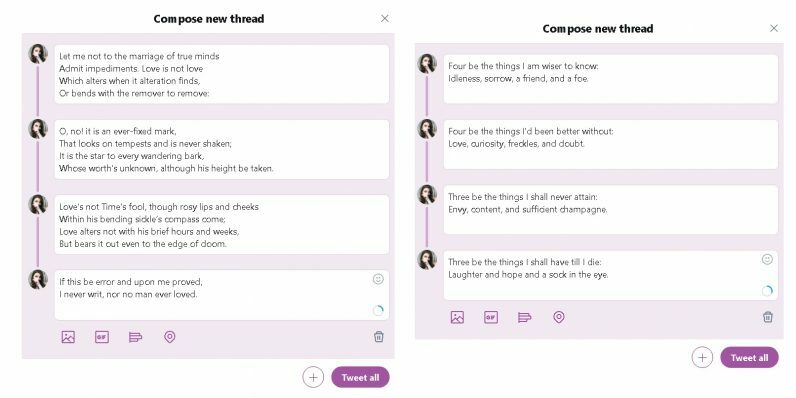 Twitter today revealed plans to give users a better way to create threaded tweets. Thanks to a new button in the tweet composer, you can add new tweets to a thread before you publish them. Threads are a popular way of expressing thoughts and telling stories too long for even the new 280 character limit to contain. Up to this point, when a user wanted to indicate that a tweet was part of a longer story and to expect a thread, they’d put something like “(1/? )” at the end of their tweet. Or they’d say outright the tweet was part of an incoming thread. Now that’s no longer necessary, as they can just tweet the whole thing at once. In order to create a tweet thread, you press the small + button at the bottom right of the tweet composer. Then you say what you want to say in a second tweet, hit the button again to add further thoughts, and so on and so on. In addition, Twitter is adding a “Show This Thread” option to allow users to view all the tweets in a thread from the beginning. I’ve been trying to write Shakespeare’s sonnets line by line, but my hands started to hurt before I exhausted Twitter. According to a Twitter spokesperson, the limit on the number of tweets you can add via the + button before you publish is 25. After your first tweetstorm goes, you can hit a button which says “Add another Tweet,” then add another 25 to your original thread. In theory, you could continue this forever. That might change depending on how people use it. The update is rolling out to iOS, Android, and Twitter.com in the coming weeks. This article has been updated to reflect new information.